Work by media students throughout the region received recognition at the 22nd annual Southern Media Showcase Day at Missouri Southern State University on Thursday, Dec. 6. Close to 400 high school students gathered in Corley Auditorium for the presentations and awards. This year’s competition featured around 500 entries in print and video work. Schools ranging from Springfield to Southeast Kansas participated and attended the event. After hearing presentations from two representatives from the Missouri Department of Conservation, highlights of the finalists’ work were shown. This year’s winners were then announced. Students receiving 1st through 3rdplace awards received medals. Certificates were presented to those who received honorable mentions. In addition to individual awards, schools were recognized with Sweepstakes awards, recognizing the highest number of winning entries. The Publication Sweepstakes award went to Joplin High School in first place, Aurora High School in second, and McAuley High School in third. Video Sweepstakes Awards went to Webb City High School in first place, Southeast High School in second place, and Branson High School in third place. 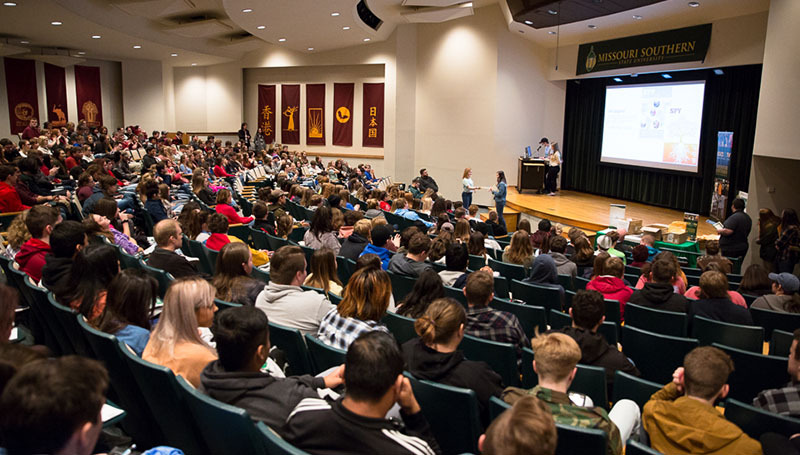 Media Showcase is sponsored by the Department of Communication at Missouri Southern State University, with faculty, staff and students working together on the event. Support is provided by the Ruth I. Kolpin Foundation, Missouri Broadcasters Association, Missouri Press Association, the local chapter of the Society of Professional Journalists, KOAM-TV and the Southern admissions office. The sweepstakes awards recognize the schools with the largest number of winning entries in the publication division. The sweepstakes awards recognize those schools with the highest number of award winners. The Passion for Video Award was named in honor of the late Will Norton. He was a Joplin High School student who shared such a passion for video making that his legacy exists to inspire those who follow in his footsteps. Teachers nominate their students for the award and faculty and staff at Missouri Southern review the nominations. NextMeet our 2018 winter commencement speaker, Dr. David Pyle.